Posted on Tue, Mar 6, 2012 : 5:15 a.m. Taking advantage of the great outdoors is a priority for so many pet owners — it's stimulating for both human and animal alike. This winter seems like it’s zipped by, and it hasn't afforded us too many opportunities to enjoy the snow with our dogs. If you like mud, that's another story. That being said, with March already here, we know that the season for warm weather isn't terribly far behind and that also means a few changes in our routine. With summer, we need not worry about the effects of what winter brings with regard to our dog's paws and our safety when walking, but we do need to safeguard against heat-related illness and the increased risk of parasites, especially ticks. We need to be concerned about ticks for not just our pets, but ourselves: these blood-sucking arachnids can transmit bacteria and disease directly into the host's bloodstream while feeding. The most well-known of these diseases is Lyme disease, named after a town in Connecticut where it was first identified in humans in the 1980s. 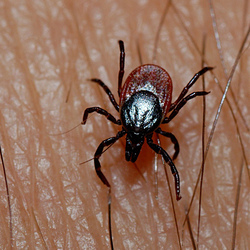 It’s caused by a bacterium Borrelia burgdorfi that is transmitted through the bite of a tick. Typically, a tick bites an infected deer or other warm-blooded animal and then passes the disease along to you or your pet by attaching itself to skin to feast on blood. The disease can cause debilitating symptoms and long-term consequences in both humans and pets. Click here to read more on that. A vaccine is available for pets to protect them from the disease, and considering our geographic location and our dog’s summer activities, this has been part of their yearly vaccination schedule since they were young. It might be a bit early in the year to be thinking about all of this, but a few days ago, some exciting news emerged about a safe way to control tick populations, possibly making our warm-weather outings safer. A new, natural pesticide, called Tick-Ex, is made of the F52 strain of the Metarhizium anisopliae fungus, which occurs naturally in soil. So, how does this fungus work to control ticks? When the spores of the fungus come into contact with the body of an insect host, they germinate and the hyphae that emerge penetrate the outer layer of their body The fungus then develops inside the body eventually killing the insect after a few days. The fungus is not harmful honeybees, earthworms or other beneficial insects, unlike many pesticides. Tick-Ex is expected to be commercially available in 2014. "A lot of people do have their yards sprayed with pesticides, and they are quite effective, because synthetic materials will give you an 85 to 100 percent success rate," notes Kirby Stafford, vice director and chief entomologist of the Connecticut Agricultural Experiment Station — an agency that did field trials on the pesticide. "But there are a special number of people who don't want to use them. The (organic product) may be slightly less effective, but it's giving people options. It certainly would fit in to organic land care." Click here to read the original article from the Bangor Daily News. Tue, Mar 6, 2012 : 4:07 p.m.
@Major... and anyone else who gets mauled by blood-suckers every-time they walk out of their door. For mosquitoes: Blend some HOT peppers &amp; Garlic, let it stew in some warm/hot water for awhile (really let the oils get in there). Poor through strainer (not a tea bag, you'll pull all the oils out of the mix, use a colander). Put all this into a garden pump sprayer type thing. Spray your bushes/trees/grass. I just run through my yard about once a week with the pump and give everything a quick spray. Mosquitoes are very territorial and they won't want to move into an area that has such a coating on all the foliage. Only use about 2-3 Hot peppers (like habaneros), any more and you'll &quot;burn&quot; your plants. And no it doesn't make your place smell like garlic, the smell goes away in about an hour. Works wonders! You can also get a few buddies, a few beers, and some of those electric tennis racket bug swatters and go to town. Population control. Tue, Mar 6, 2012 : 3:08 p.m.
Now if only this would work on mosquitoes!! I can only imagine how bad this year will be after such a mild winter! !